Huge Savings Item! Save 14% on the UTKilts Men's Gray Highlander Tartan Utility Kilt (32) by UT Kilts at Mas Fashion. Hurry! Limited time offer. Offer valid only while supplies last. MEASURE BEFORE YOU BUY! DO NOT USE YOUR JEANS/PANTS SIZE TO ORDER! This is our gray highlander utility kilt with side cargo pockets and black studs. MEASURE BEFORE YOU BUY! DO NOT USE YOUR JEANS/PANTS SIZE TO ORDER! This is our gray highlander utility kilt with side cargo pockets and black studs. This is our entry level utility kilt. However, it is not just for those new to kilting will enjoy this simple, yet rugged design of a utility kilt. It has good sized cargo pockets that will fit the common items a guy wants to carry these days. Pleats are also sewn down to make sure you always get that perfect look, no matter the activity. It also has to sets of snaps to make sure you have a solid, comfortable fit. Don't let anyone tell you that GREAT quality can't come with a LOW price on a utility kilt. 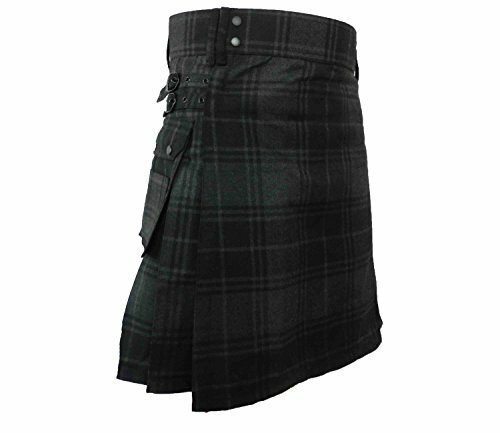 The UTKilts Black Watch utility kilt gives you amazing quality, low price, and a fabulous look. You won't find anything like this anywhere else! MEASURE BEFORE YOU BUY! DO NOT USE YOUR JEANS/PANTS SIZE TO ORDER! BE SURE TO MEASURE! DO NOT USE YOUR JEANS SIZE!